Grammy-award winning Teddybears (Giorgio Moroder, Max Martin, Charli XCX, Cee-Lo Green, Beenie Man) have recently been featured in FiFA, Peugeot, Nike and Marshall Headphones, and have worked with the upcoming new Island Records act called Petite Meller. The band are now ready to release their new single called Marathon Man featuring Cutty Ranks. With many Grammy Awards under their belts, many big names using their songs such as Peugeot, Marshall, Nike and FIFA 2015, as well as having written one of this summer’s hits for Giorgio Moroder and Charli XCX Diamonds, Teddybearsare are quickly moving forward. After having worked with a number of superstars such Max Martin, Cee-Lo Green, Sia and recently Beenie Man, Teddybears are ready to release a new and fresh single called Marathon Man, featuring Cutty Ranks. Marathon Man is a typical example of two sides in one song interlaced between a pacey electro beat and a retro feel as well as slowing down into a trap/dubstep-like essence, all in the same track. 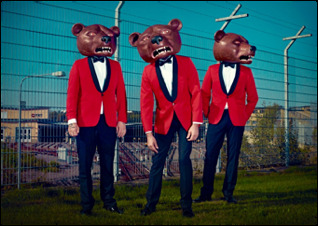 Taking inspiration from Ninja Tune’s Thundercat and Elephant Man,Teddybears have packaged yet another song into a unique yet catchy piece of music. Marathon Man is taken from the band’s upcoming new LP called Rock On, and it will be out for sale and download everywhere 16th October on Polydor Records.